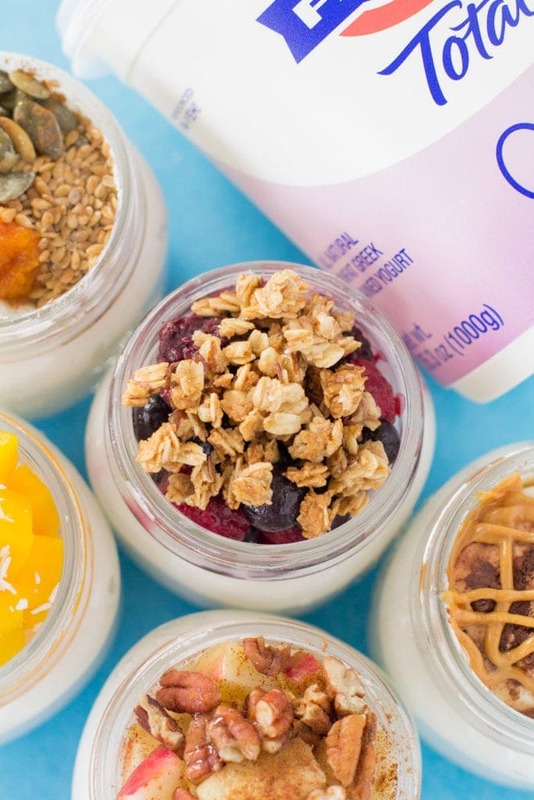 These 5 Healthy Yogurt Parfaits are perfect for meal prepping as a breakfast, snack or even dessert! 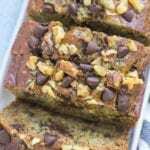 Made with protein packed yogurt + easily customizable! 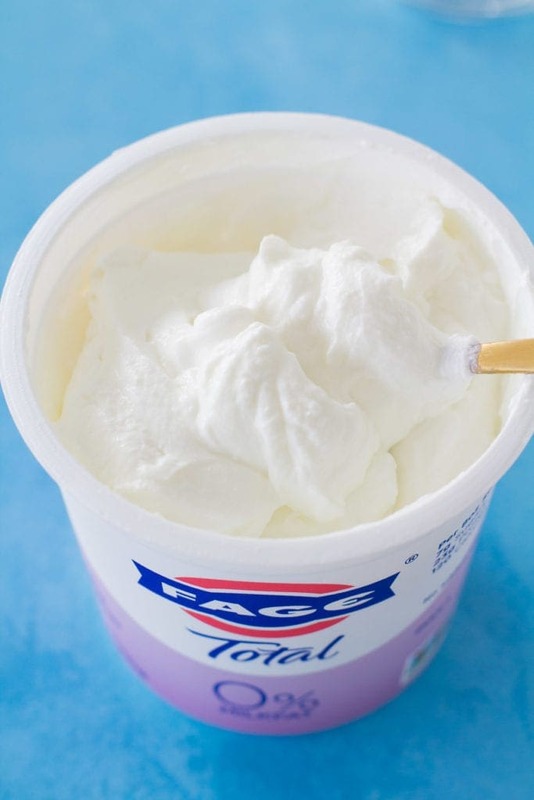 This post is sponsored by FAGE; however, all thoughts and opinions are my own. 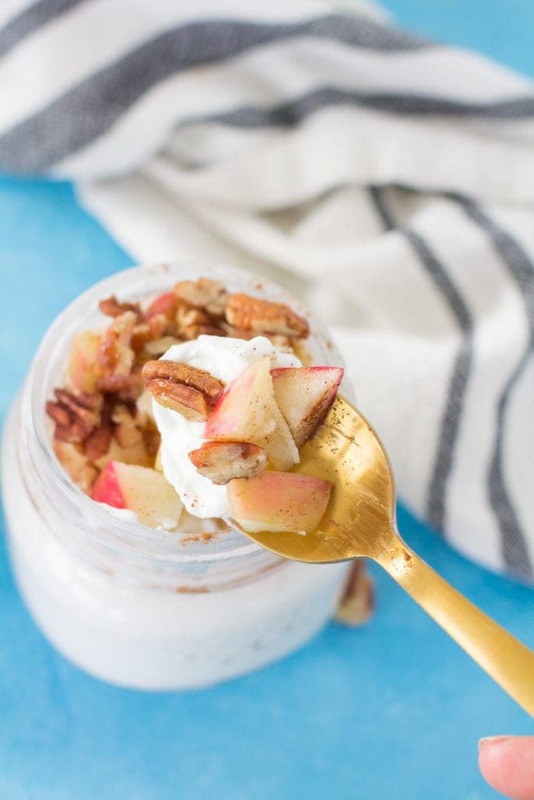 Say hello to your new favorite breakfast: these 5 Healthy Yogurt Parfaits! I’ve been making homemade yogurt parfaits for years and am so excited to share some of my absolute favorite combos with you today! 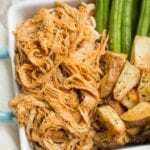 These parfaits are super quick to toss together, meal prep friendly, and just downright delicious! 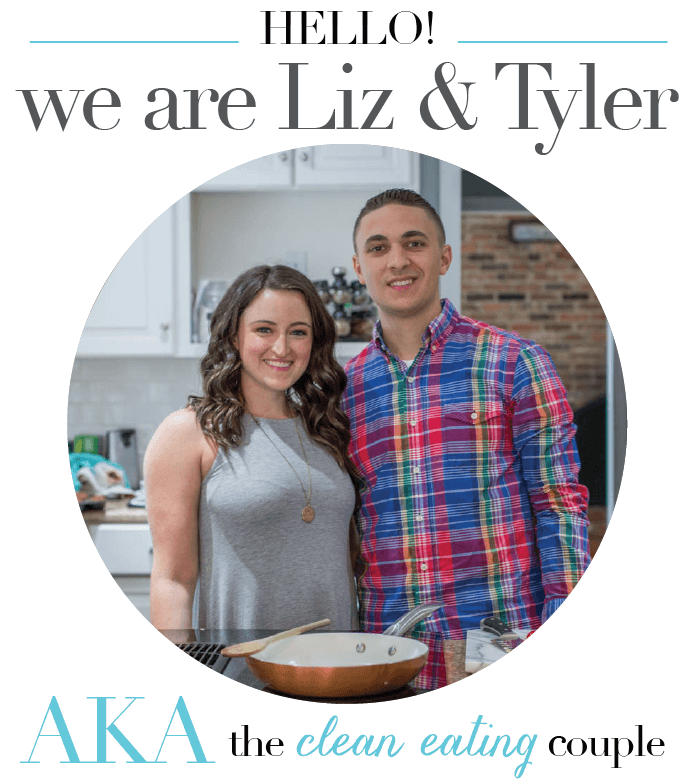 With the new year upon us, I know many of you are probably trying to figure out this whole healthy eating thing.. maybe you’re feeling overwhelmed and confused…. 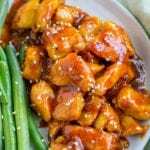 Or if you’re a healthy eating veteran.. maybe you’re feeling a little bored and sick of the same recipes? 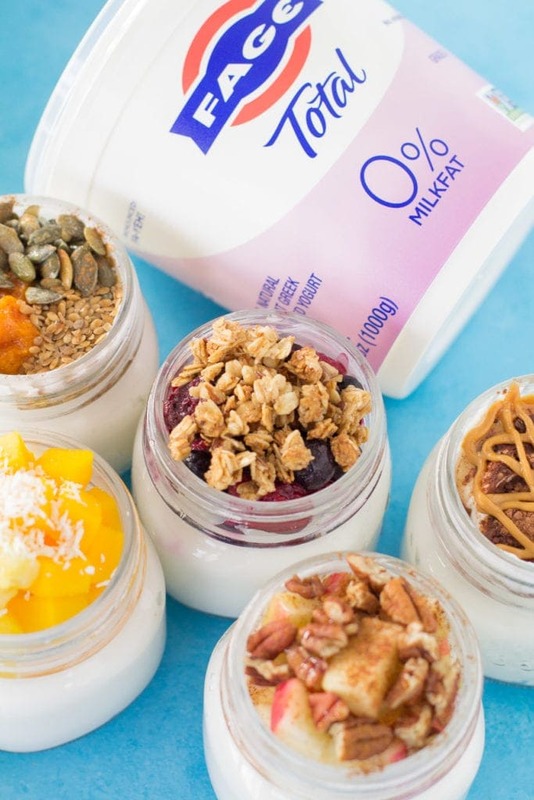 Either way, no matter where you are in your health journey – these meal prep yogurt parfaits will be able to help you! 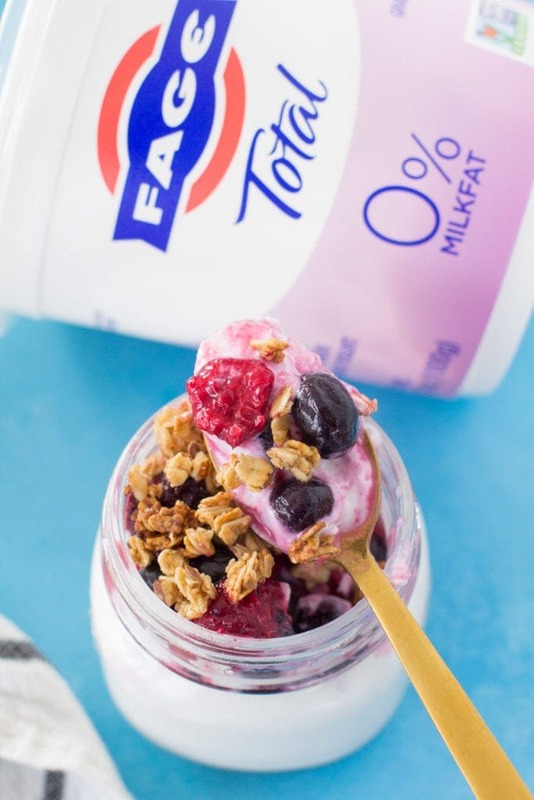 I’m really excited to partner with my friends at FAGE Yogurt to share these yummy parfaits with you. Their yogurt is my absolute favorite. It’s got a super rich and creamy taste, while being high in protein, having no added sugar, and being completely non-GMO. I mean helloooo. LOOK at that texture!! But if that’s not your style.. maybe you’re more of a chocolate peanut butter person? If you’re not a chocolate peanut butter person we probably can’t be friends (kidding…) but maybe you’d be into these Berry Granola Parfaits?? I use frozen berries so that when they thaw a little they add yummy fruit juice to the yogurt! You can use store bought granola (opt for a low sugar one!) or this is my favorite homemade granola recipe! 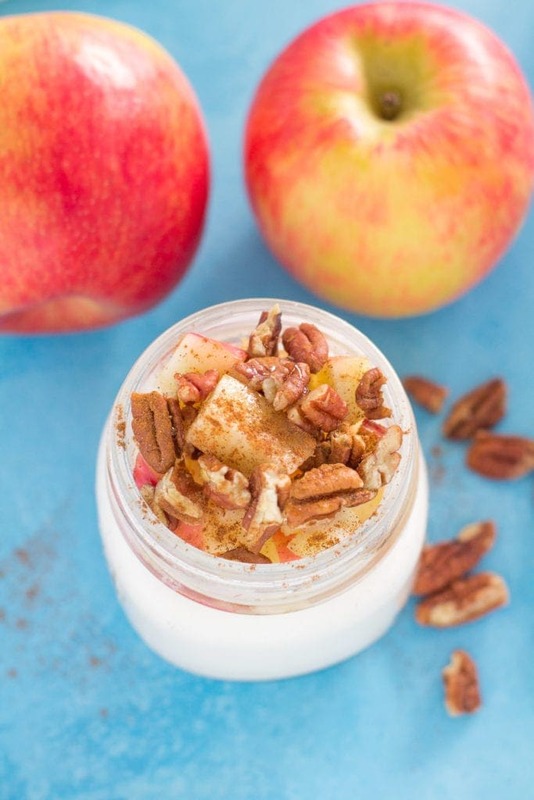 This Apple Pie parfait is another option.. the crunchy apples and pecans with the creamy yogurt is SO good!!! And lastly theres Pumpkin Flax! 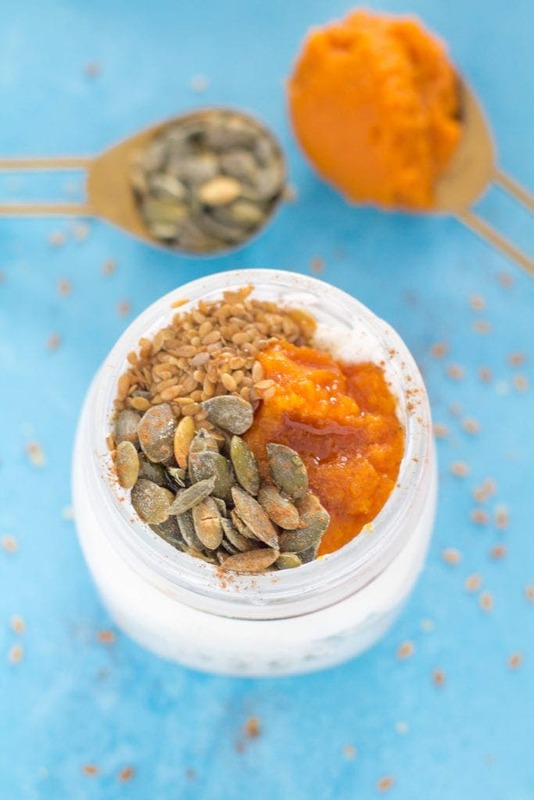 Which is basically like a healthier version of pumpkin pie in parfait form in case you were wondering. Ok so clearly you can see ALL of these parfaits are delicious.. but you might be wondering what makes them healthy? 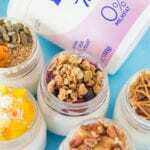 What makes these yogurt parfaits healthy? 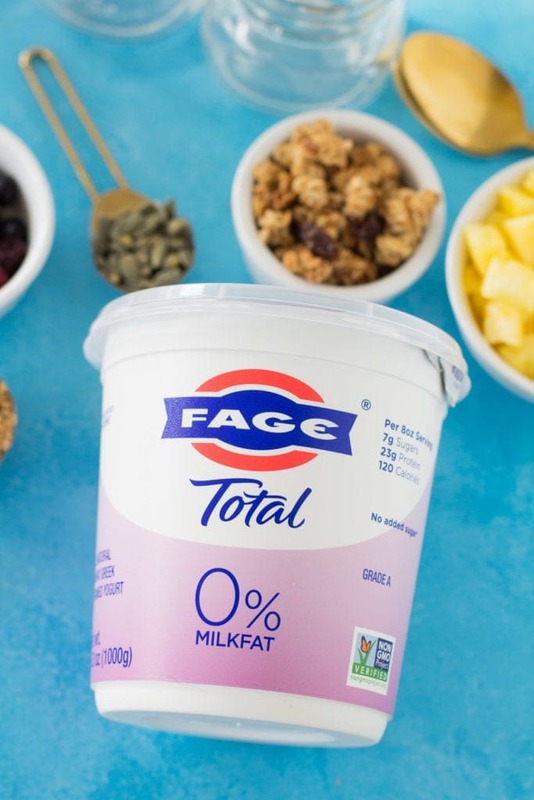 Great quality yogurt– As I mentioned before, FAGE is my favorite brand of yogurt! 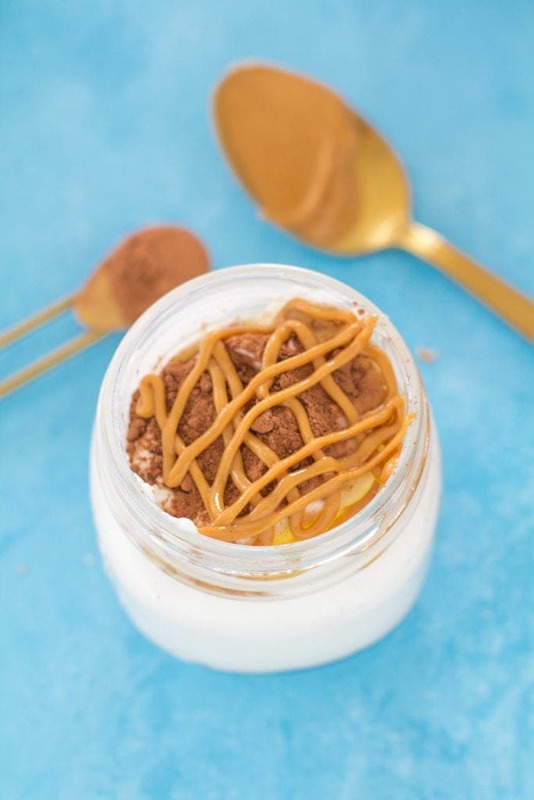 It’s has no weird fillers or junk added to it, so you’re starting off these parfaits the best possible way! 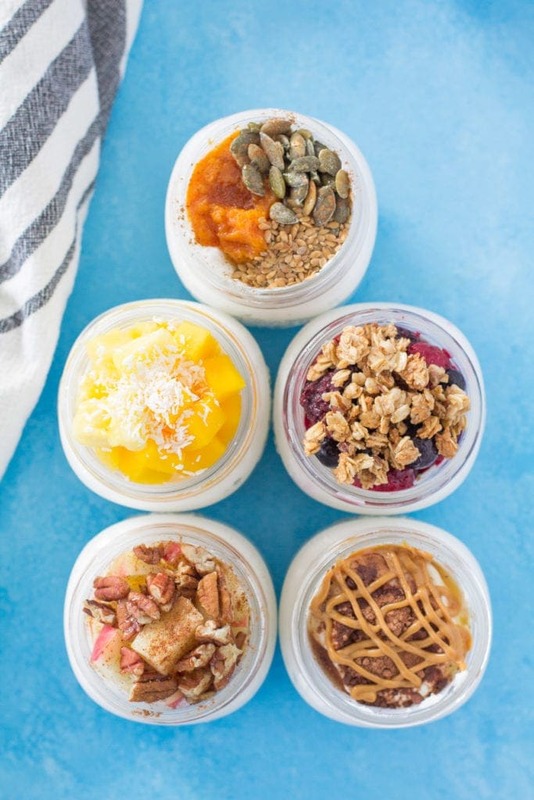 Low Sugar – These parfaits have minimal amounts of sugar, and can be completely refined sugar free if you choose! Some yogurt brands have 30+ grams of sugar in just one small cups (which is MORE than most candy bars have.. crazy.. right?! Customize-able– Similar to how you can control the sugar in these parfaits… you can really customize everything! You can choose to do more or less fruit, granola, seeds.. whatever you like! Protein Packed– These yogurt parfaits offer about 25g of protein per parfait which is perfect for a filling breakfast or healthy snack! 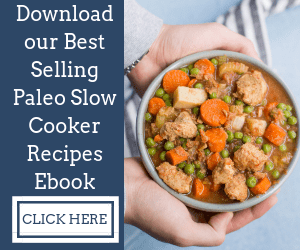 Reduces Waste – Not necessarily healthy for you, but for the earth! I like to by the 35.3 oz FAGE container to reduce my waste. Instead of buying individual cups, you’re only buying one large carton and packaging it in your own. 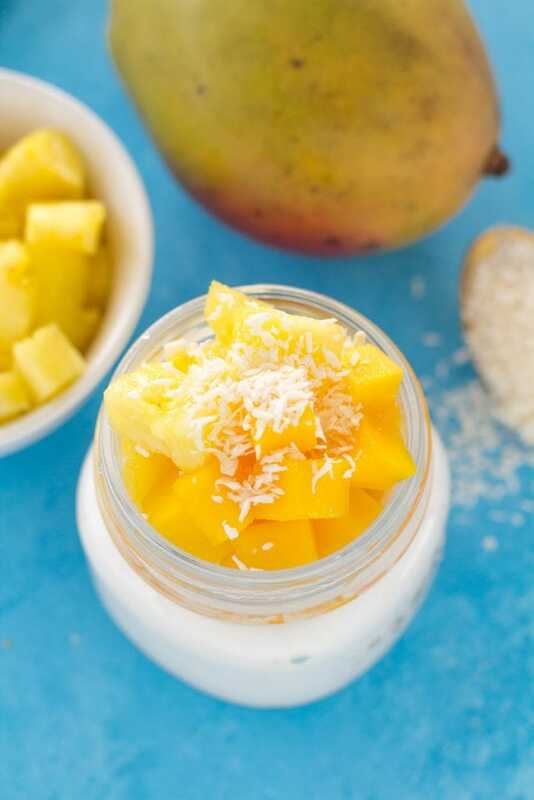 You can store these parfaits in glass jars or containers in the refrigerator for up to 5 days. I recommend layering the yogurt on the bottom and keeping your toppings on top for best results. 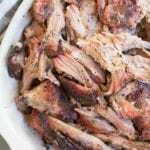 By keeping the toppings at the top it will help prevent them from getting soggy. 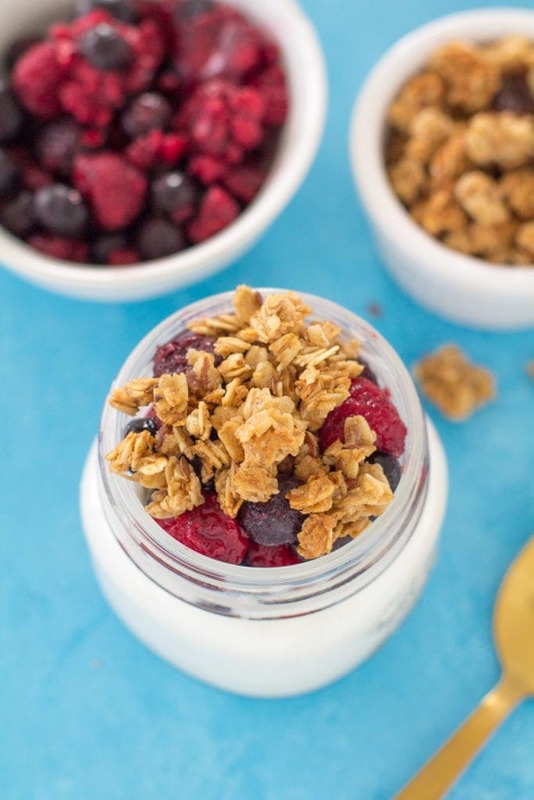 These 5 Healthy Yogurt Parfaits are perfect for meal prepping as a breakfast, snack or even dessert! 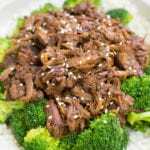 Made with protein packed yogurt + easily customizable! Prepare 5 glass mason jars. Fill each mason jar with 1 cup of FAGE 0% Total Yogurt. Add parfait toppings to individual jars. I recommend leaving them on top of the yogurt and stirring together only when ready to eat. Cover parfait jars with lids + store in refrigerator for up to 5 days. 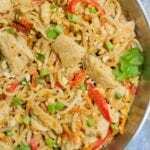 When ready to enjoy, simply remove from the fridge, stir + enjoy! You can store these parfaits in glass jars or containers in the refrigerator for up to 5 days. I recommend layering the yogurt on the bottom and keeping your toppings on top for best results. 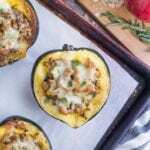 By keeping the toppings at the top it will help prevent them from getting soggy!